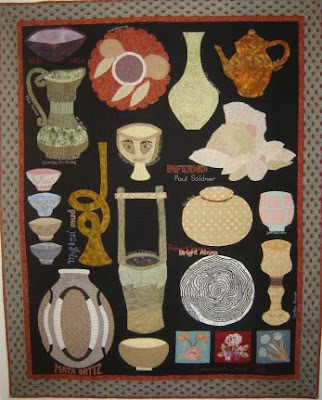 The quilt I made for the American Museum of Ceramic Art raised $1200 in donations. I made Magical Mud as a fund raiser for the museum last February. The winner is an active member of the museum and is truely appreciative of the images representing the collection and exhibits. The money raised will help fund educational programs. are you trying to tell me i didn't win? aw come on! way to go JANET! Nicely done! what a great donation you gave! is that all appliques? Oh how wonderful Janet, congradulations for creating a quilt that was truly appreciated and for such a great cause. Janet, what a wonderful quilt, and it sounds like just the right person won it! How wonderful! You should be very proud. Wow...that's quite impressive! Good for you! I love it when these quilts go to someone who will appreciate them. well done on the money raised. "WINGS OF SUNSHINE AND POSEY PINK"